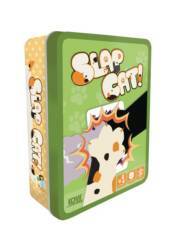 In Slap Cat!, you play as a mad scientist attempting to assemble the world's most adorable cat! Draft cards by quickly slapping them as they are revealed. Earn bonus points for kitty fedoras, bows, balls of yarn, and more. But be careful, slap too slow and you could be left with a hand full of fishbones! Bullet points: + A Card Drafting Cat Game for Up to 6 Players! + Collectible Tin Packaging! + Advanced solicited for February release!